Treviño's Blog » Archives » Ubuntu goes GNOME, theming stays. Let’s test (and tune) it! If you haven’t already, here’s how I recommend you get started. Install the latest Ubuntu 17.10 daily image (if not going wild and trying this in 17.04). After installing it, install gnome-shell. Install gnome-tweak-tool if you want an easy way to change themes. On the login screen, switch your session to GNOME and log in. Attach a screenshot to the Launchpad issue. Ubuntu’s default icon theme is ubuntu-mono-dark (or -light if you switch to Radiance) but most of Ubuntu’s customized icons are provided by humanity-icon-theme. If you want to help with the theming itself, you’re very welcome. Gtk themes are nowadays using CSS, so I’m pretty sure that any Web designer out there can help with them (these are the supported properties). All you have to do, is simply use the Gtk Inspector that can be launched from any Gtk3 app, and write some CSS rules and see how they get applied on the fly. 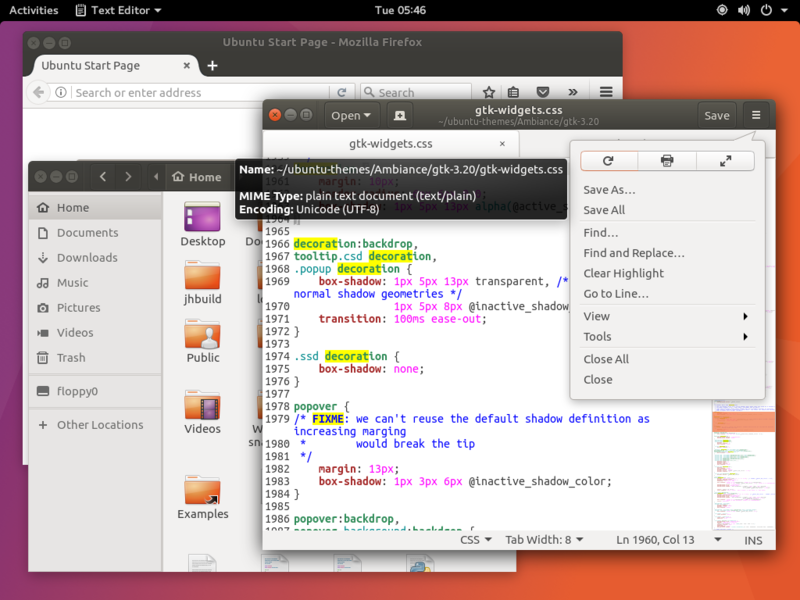 Once you’re happy with your solution, you can just create a MP for the Ubuntu Themes. Let’s keep ubuntu, look ubuntu! PS: thanks to Jeremy Bicha for the help in this post.